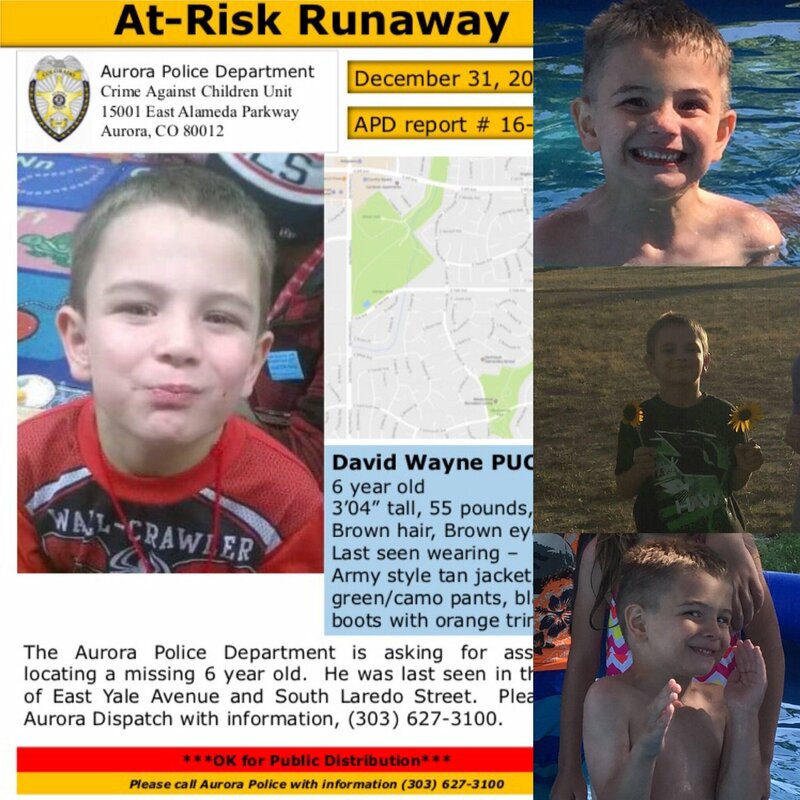 At -Risk (due to his age) David Puckett, 6, was last seen at his home in Aurora, Colorado on New Year’s Eve at 1745 Hours MST (New Year’s Eve) and has not been located as of this post. Criteria used to activate an Amber Alert has been deemed in this case as not having all of the identifiers needed to issue the Alert. It appears he has simply wandered off and not abducted. David Puckett, 6, is described as a white male, 3’2″, 55#, brown hair and brown eyes. He was said to be wearing green camo pants, black t-shirt, orange trim on his black boots and a light Girl’s tan army style jacket. He is a student at Dartmouth Elementary School. On December 31st when David was reported missing, a huge presence of Law Enforcement Officers, personnel and volunteers came out in full force representing such units as Major Crimes, Citizens Missing/Abducted Response Team (CMART), Arapahoe County Deputies, Jefferson County K9 Team (1 Bloodhound) and over 400 volunteers from the Aurora Citizens Police Alumni Association and Aurora PD patrols. Dallas PD’s Air One with a mounted FLIR also assisted from the air. Resources searched well into the night but still were unable to locate the missing child. On New Year’s Day, David still had not been found and resources from APD (Aurora)’s ERT, SRT, Crimes Against Children Unit, FBI and hundreds of volunteers put their NYE plans on hold to search for missing David Puckett. David Puckett is considered as an At Risk child (due to his young age) and has been reported as gone missing (wandered off) two times before but has always been returned to his parents by concerned citizens. 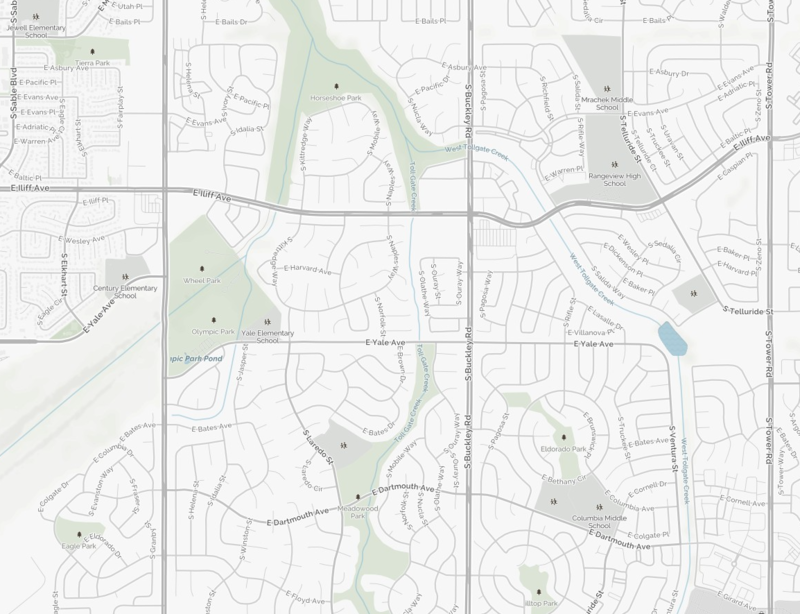 Police have sent out three (3) reverse 9-1-1 calls that have expanded to a 2.5 mile radius reaching 27,000 residents within Aurora, Colorado. Police are also providing updates through their Social Media Channels, such as Facebook and Twitter. They are asking all of us to help them get the word out there by RT broadcasts, etc. Police held briefings to plan their day of searching and coordination of volunteers. On Monday, January 2nd, Police will again send out the bloodhound K9 team. There is no other need for additional volunteers at this time. We sent a request to Aurora PD for additional information asking if the Bloodhound K9s are finding scent trails and if there are any bodies of water nearby. Additionally, we have asked the size of their search perimeter to gain a feel of how their Search is set-up. It is currently mostly cloudy with temps at 40*F with winds at 16 mph and humidity of 38%. There is a zero chance of any precip today. Temps are expected to drop later this evening into the 20’s with a chance of snow showers on Wednesday and Thursday of this week. To relieve pressure from the 9-1-1 Communications Center, three (3) Tip Lines have been set-up @ 303-739-1870, 303-739-1865, 303-739-1868. Those who wish to remain anonymous can still report any information to Law Enforcement to collect the Reward. A $5,000 reward is being offered by the Metro Denver Crimestoppers for any Tips or the location of David Puckett. You can call them or the Aurora Police Department at 720-913-STOP (7867). We are using the hashtag established for this missing child’s case as #FindingDavid. Please follow us on our Social Media channels (Twitter, FB) for more updates. When we were back in our SAR Days as volunteers, my hubby had a Bloodhound named Banjo (yes, he even came from midwest) who was a born-natural (okay, aren’t all of them?). For those of you that are not familiar with the types of Search Dogs and their capabilities, here is a quick lesson. The National Center for Missing and Exploited Children (NCMEC) state over 2100 kids go missing every day and 58,000 children annually are taken by someone they don’t know. Not every search has a SAR K9 team to help find them. This search has deployed the usage of three Bloodhounds which is very great in #FindingDavid. These SAR K9s dogs have the natural drive to locate their subject (missing person) and will most likely have their human counterpart wear out first before they do. There are two kinds of SAR Dogs. Air scent and Trailing SAR K9s. All humans constantly emit microscopic particles bearing human scent. By the millions, these particles become airborne and can be carried by the wind for considerable distances. Airborne scent is concentrated near its source, follows the air currents, and becomes more dilute the further it travels. An air scent SAR dog is especially trained to locate the scent of any human in a specific area and close in on the source of the scent in heavy forested and rural/urban areas. SAR Dogs work best in the morning and evening, day or night, all types of weather and to give them a higher chance of finding their subject, be called immediately after the missing person has been reported. These dogs are mostly off-leash and roam freely back and forth to their Handler at large distances. A trailing dog is one that searches by the scent on the ground. They are generally trained for scent discrimination. Each dog is usually worked in a harness, leash and some type of article that belongs to the subject, such as a brush, comb, clothing, shoe, etc. will allow the dog to “breathe in” the scent. The dog is trained to only follow that scent and no other. At times, the K9 may track, follow the footsteps or hone in on the scent in the home. Bloodhounds have been known to find a missing person when the scent has been pooling for hours, days, weeks and even several months. It is also possible for them to find someone who may have left the area in a car if the windows were open allowing the human cells to fall off into the wind. They can also find those in water as well. To find out more about Search and Rescue Dogs, visit Dogs in Search and Rescue‘s website, http://www.ussartf.org/dogs_search_rescue.htm.